Film relives first mass US college shooting Jump to media player A documentary about the infamous 1966 University of Texas tower shootings has been making an impact at the SxSW film festival in Austin, Texas. Twenty years inside a California cult Jump to media player A new film called Holy Hell documents 20 years inside a California cult. Latinos overlooked in Hollywood Jump to media player Latinos in the US have become increasingly frustrated that actors from their community are struggling to win Oscars and secure significant parts in films. 'Amy' director's fictional take Jump to media player Asif Kapadia, the director of Oscar nominated documentary Amy, talks about his latest fictional film. The Indian film set for Netflix fame Jump to media player A new Indian film, Brahman Naman, has ditched the traditional Bollywood style of film-making in a bid to win international audiences. Talking Movies' Tom Brook explains how. All-star cast in credit crunch movie Jump to media player The Big Short is inspired by the 2008 global financial crisis and has a heavyweight Hollywood cast including Steve Carell, Brad Pitt, Ryan Gosling and Christian Bale. Star Wars: How an epic story began Jump to media player As the new Star Wars film arrives in cinemas it is for millions of fans more than just a movie going experience. To find out why Talking Movies' Tom Brook has gone back to the origins. In 1966, an infamous act of gun violence in Austin, Texas, left 16 people dead and more than three dozen wounded. 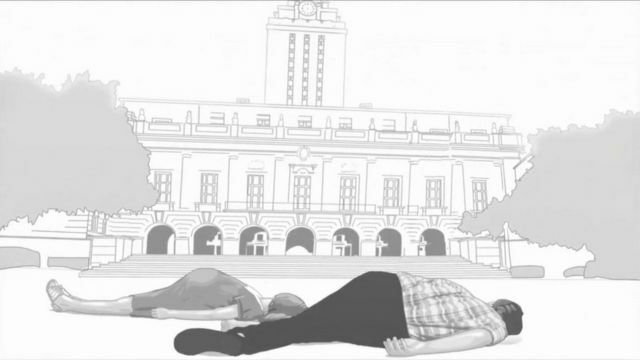 A documentary about the University of Texas tower shootings has been making an impact at the SxSW film festival in Austin. The film arrives amid controversy in the state over a soon-to-be-implemented law that will enable students to carry firearms into the classroom. Unusually the documentary, called Tower, relies largely on animation to tell a story that some involved with the film hope will sway opinion.